Who : Kimberley Beyea voice and flute, Barry Turner guitar and Matt Cabana on bass. Who: Kimberley Beyea voice and flute, Barry Turner guitar and Matt Cabana on bass. Where:l’église St-Georges (23 rue Perrault) au coin des rues Saint-Georges et Maple,Ste-Anne-de-Bellevue. 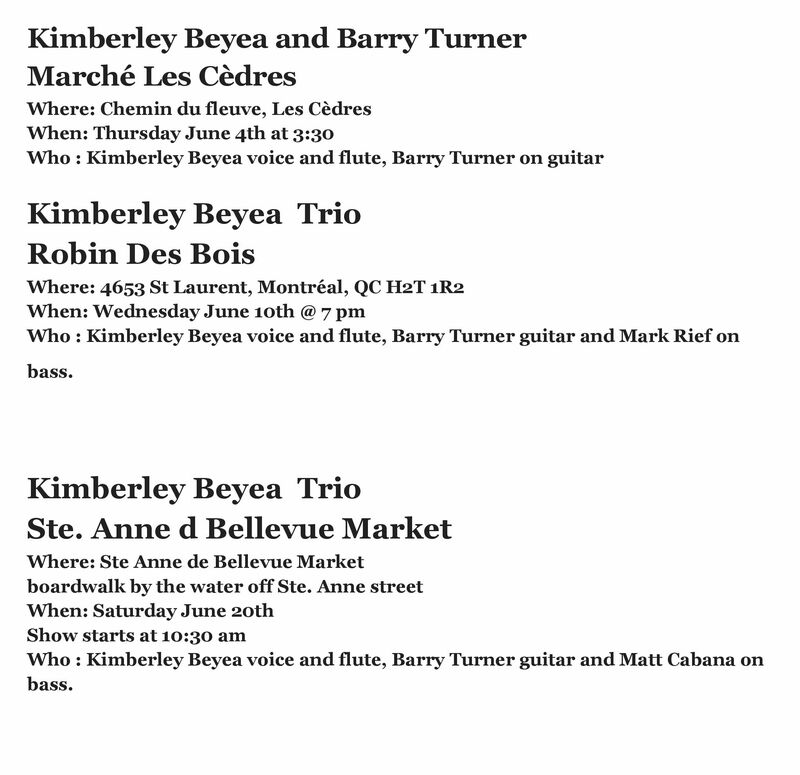 Who : Kimberley Beyea voice and flute, Andrew Cabana on guitar , Mike Arless on Bass,Jon Farley on drums. When: Friday August 14th @ 8:30pm, 10:15 pm, & 12 am. 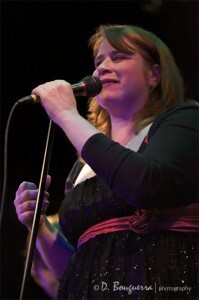 Who : Kimberley Beyea voice and flute, Barry Turner guitar and Matt Cabana on bass. Special guest Andrew Cabana on trumpet and Denis Cabana on trombone. Who : Kimberley Beyea voice and flute, Barry Turner guitar and Matthew Cabana on bass. Kim Beyea voice/flute, Barry Turner guitar, Matthew Cabana Bass, Andrew Cabana trumpet. Friday November 28 th. Shows @ 6, 7, 8 pm. Friday November 21 st. Shows @ 6, 7, 8 pm. Friday November 14 th. Shows @ 6, 7, 8 pm. Friday November 7 th. Shows @ 6, 7, 8 pm. 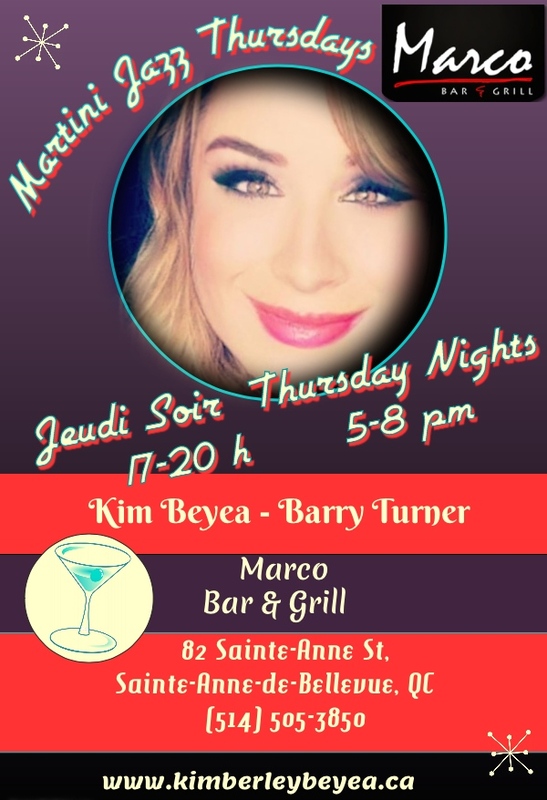 Who : Kimberley Beyea voice and flute, Barry Turner guitar and Mark Rief on bass. June 21st, August 9, August 30 th. Kim, Drew, Mike and Jon, Rock Cafe Herbs. A great night of jazz and giving. We are collecting unwrapped new toys for the Montreal Children’s Hospital. More than 50% of the patients are under the age of 3. Therefore toys for infants and toddlers are in HIGH demand. Items to offer adolescents gifts for special occasions are also quite sparse. Please keep these in mind when planning a donation. Let us spread some joy this Holiday Season. Thank you in advance for giving to the children. 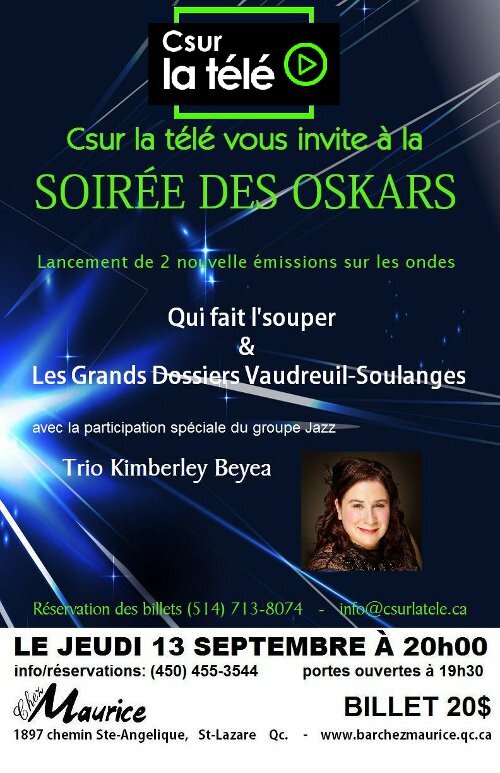 Kimberley Beyea Trio Cd Release at Upstairs! 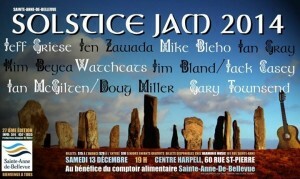 Where: House of Jazz 2060, Aylmer, Montreal, QC. Mother’s Day Show at Upstairs! Check back often for Kimberley’s shows and appearances!